Triflemore can be found on Facebook! RadioIndy is pleased to announced that we have published our CD Review of Triflemore music to Facebook. FANS - Please checkout Triflemore iTunes page play / purchase some great new music! RadioIndy is pleased to announced that we have published a music playlist and CD Review with Triflemore music (and similiar Big-Name Artists) to their Rhapsody artist page. RadioIndy is pleased to present Triflemore with a GrIndie Award for the CD "Words From Notes"
Triflemore blends the guitar and voice into one beautiful sound on their latest disc, “Words From Notes.” The talented duo is comprised of singer Susan Rhea, who hails from small-town America, and guitarist Owen Goudie from the Shetland Islands. Together, their collaborative talents combine to produce a touching CD, filled with throwback sounds of folk singers from the late 1960’s. Rhea’s voice is reminiscent of Joni Mitchell in all the best ways imaginable. Her voice is wonderful to hear and her eloquent tones can be heard on songs like “Goudfield” and “Perfect.” Not to go unnoticed, Goudie’s finger style guitar work is also exceptional in its own right. You can tell he has crafted his melodies around Rhea’s vocals and intertwines them so one does not overshadow the other. A highlight of his playing can be heard on “Signal.” “Words From Notes” is a perfect fit for any Joni Mitchell or Emmylou Harris fan and could very well be used to paint the soundtrack of all of our lives. "Words From Notes" Reviewed by RadioIndy.com! RadioIndy is pleased to announced that we have published our CD Review of Triflemore's music to CD Baby. FANS - Please checkout Triflemore's CD Baby page here and sample / purchase some great new music! Triflemore Press Release on Digg.com! FANS: Increase the popularity of this DIGG press release by visiting our homepage at www.radioindy.com and looking for the "Press Release" section in the lower right. Here, you can find and "DIGG" this press release for Triflemore. Radioindy Review for Triflemore has been added to Myspace Music! 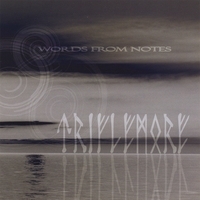 We're delighted to announce that our first album, Words from Notes, is available to buy online from cdbaby (CD and mp3), Itunes, amazon, Rhapsody, and tradebit.